Making good music is vital, but it`s not enough. You need more than that. How is the rapper Pharrell Williams doing it? Pharrell Williams is an American singer-songwriter, rapper, record producer and fashion designer. Williams and Chad Hugo make up the record production duo the Neptunes, producing soul, hip hop and R&B music. He is also the lead vocalist and drummer of rock, funk and hip hop band N.E.R.D. Pharrell has produced numerous hit singles for various recording artists, and he earned eleven Grammy Awards including two for the Neptunes. He currently owns a media venture that encompasses entertainment, music, fashion, and art called i am OTHER, a multi-media creative collective and record label that serves as an umbrella for all of Pharrell Williams` endeavors, including Billionaire Boys Club and Ice Cream apparel, Billionaire Girls Club, textile company Bionic Yarn and a dedicated YouTube channel launched in 2012. By August 2003, Pharrell and the Neptunes had produced a stunning 20% of all the music being played on British pop radio and 43% of the music being played on American pop stations. 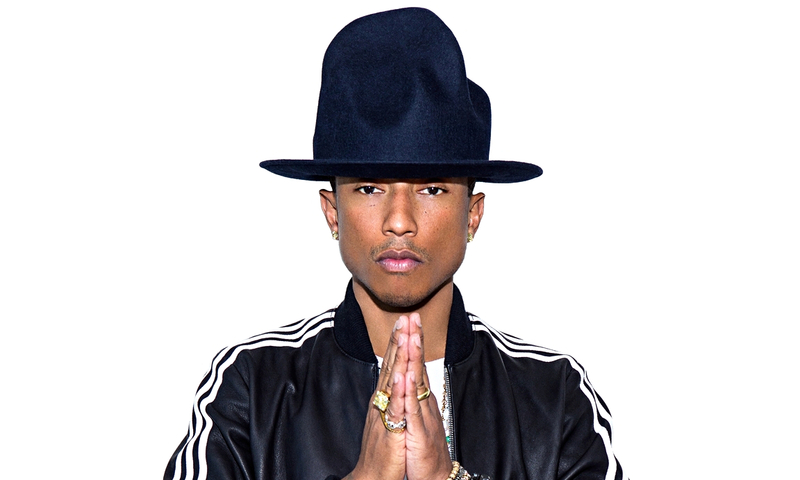 Pharrell went on to write a verse and help produce for Wreckx-N-Effect`s 1992 hit «Rump Shaker». The same year he also performed a small rap solo on SWV`s second hit «Right here». The Neptunes have produced Britney Spears`s single «I`m a slave 4 U». They also reached number one in the U.S with Nelly`s single «Hot in herre». Pharrell featured on Daft Punk`s mega hit «Get Lucky» and in march 2013, he wrote and produced the monster hit «Blurred Lines» for Robin Thicke. The Neptunes were named «producers of the year» in 2002. Pharrell has that rare gift for creating music, tracks, hooks and lyrics. Always one step ahead of the curve. He is not only good at making great music, and last month at the World Economic Forum at Davos, Pharrell made a big announcements to prime ministers, billionaires, and CEO`s. He announced a concert over seven continents to mobilize support for a UN climate pact in Paris at the end of the year with his collaborator, Al Gore. That`s what`s makes this man so unique, because tackling climate change is not what we might expect from a rapper and hip hop producer. He released his first solo single in 2006, and the album failed. It took a long time for him to find the reason behind it: he wasn`t being true to himself. He tried to be like other rappers and producers. He changed the strategy and got back to his own roots. He was tired to mimic Jay Z and P. Diddy, so he created i am OTHER. An organization dedicated to reaching young people who feel different and helping them use their unique talents to launch creative ventures. Mark this words folks: Individuality – Individuality – Individuality! That`s the future. Individuality is the new wealth. It makes things grow! There`s another interesting thing behind this success. The friendship behind Pharrell`s success that harkens back to many connectionally intelligent friendships and partnerships throughout history, like Albert Einstein, who refers to his closest friend, Michele Besso, as «the best sounding board in Europe». So how was Einstein able to create his theory of relativity? By his daily walks with Besso, discussing a shared love of the violin and scientific exchange. As Einstein recalled at a lecture in Kyoto in 1922: That was a very beautiful day when I visited Besso and began to talk with him as follows: “I have recently had a question which was difficult for me to understand. So I came here today to bring with me a battle on the question.” After a lot of discussions with him, I could suddenly comprehend the matter. The romantic myth of the lone genius fails because it obscures the social, connected qualities of innovation. The pair is a «primary creative unit,» because it is a fundamental, fractal and recurring shape in the patterns of innovation. The creative pair is a natural and powerful expression of connectional intelligence that is often central to getting BIG things done. Pharrell created i am OTHER to give a voice to kids who were like himself. At i am OTHER, Pharrell funded and mentored kids who wanted to break into all of the fields to which he had access: fashion and entertainment, but also tech and manufacturing. the growth of the creative class and the collaborative economy». Investors for the Collaborative Fund includes Chad Hurley, co-founder of YouTube; Chuck Temple and Tony Hsieh, CEO of Zappos to name a few. But he did more. He co-founded a manufacturing company, Brooklyn Machine Works that crafts handmade bikes.